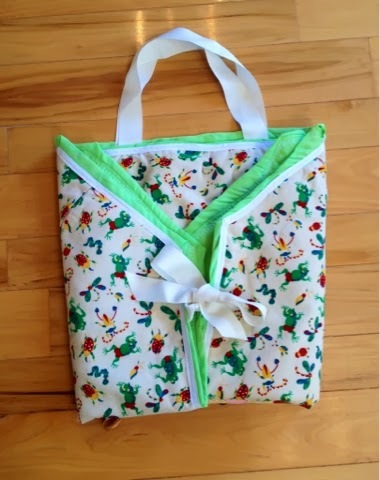 This portable play mat converts to a bag to carry toys. This past weekend we welcomed the arrival of my newest nephew, nephew number nine for me! Although my husband and I find ourselves fertility-challenged, the rest of my family are prolific breeders. Naturally, I decided to wait until the baby arrived to get on Pinterest and look at baby gift ideas. You will find many, many options on my "Gift Ideas", "Kids", and "Sewing" boards. 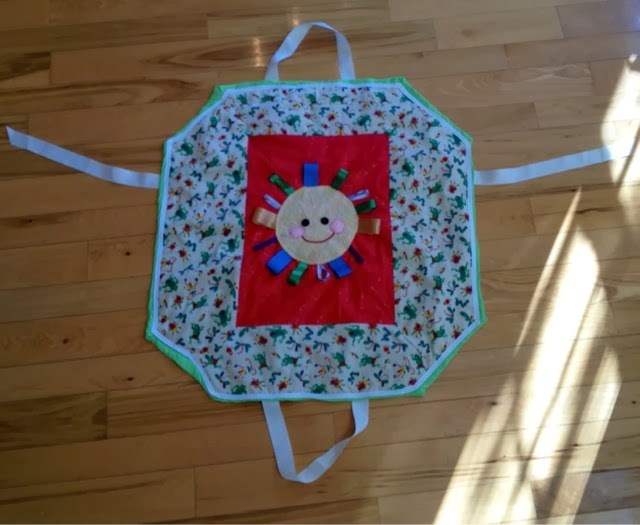 One I thought was fab is a portable play mat for baby that cinches up into a bag for travel. You can order a pattern, and I think a completed mat, from Etsy (see my Pinterest Sewing board for the link), but I wanted something slightly different so I designed my own. I'm hoping my sister will be too busy with her 6, 2, and 5-day old kids to read my blog so this gift is a surprise! If not...surprise! The original mat/bag is a hexagon, patchworked together of strips of cloth. It's adorable and cinches up into a circular bag with a long drawstring, but I didn't think it looked long enough for a baby to really lie down and play or sleep. The baby in the picture is sitting up. I also didn't have enough matching material to make the drawstring, which looks about four feet long! I decided to make a longer mat that folds into a bag without the use of a drawstring. 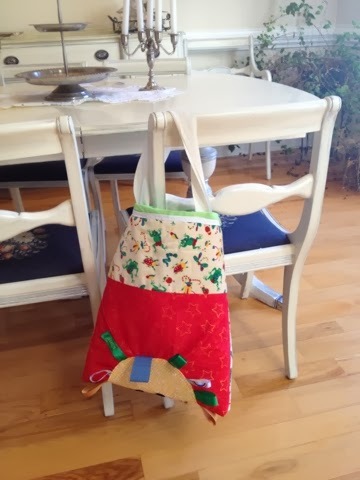 This makes it less ideal as a bag; small items could possibly fall out the sides, but it's great for carrying larger toys, burp cloths, and things like that. 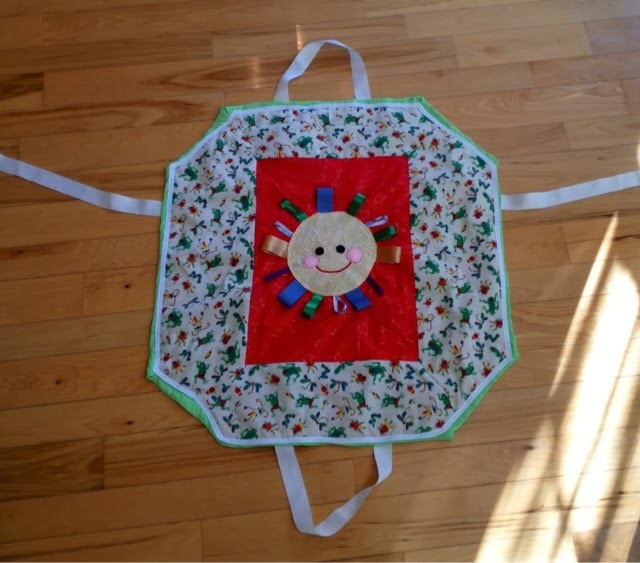 When you get where you're going you can unfold the mat and spread baby's toys out on it. 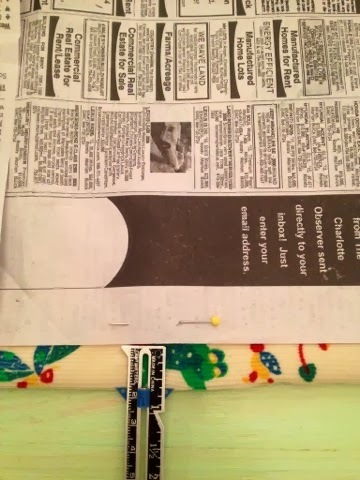 Lay newspaper pieces out to the size you want. 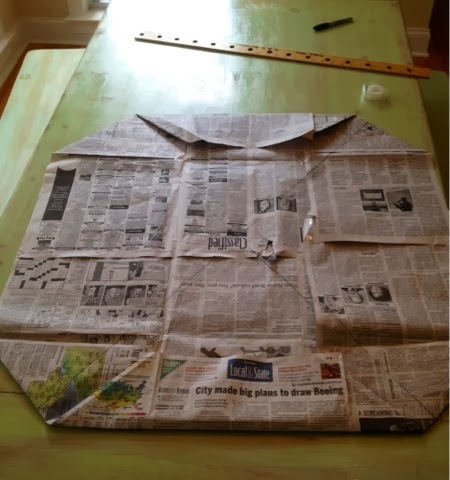 I used newspaper to make my pattern. 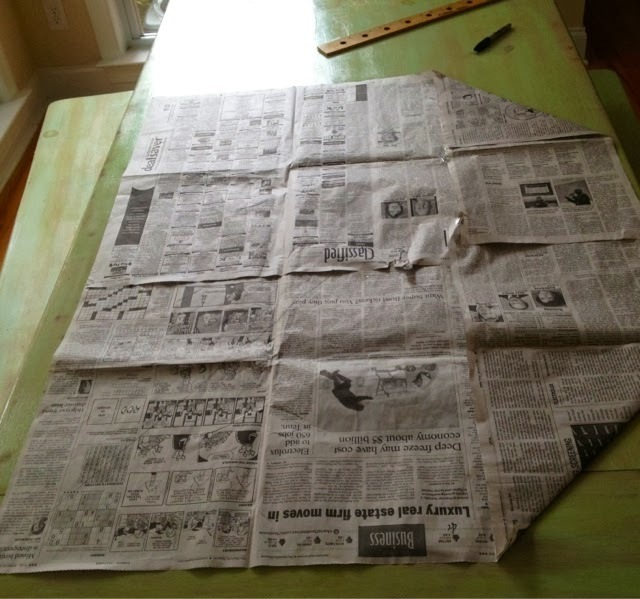 I like to use newspaper because the fold lines and columns act as measuring guides and make it a lot easier to map out symmetrical pieces. 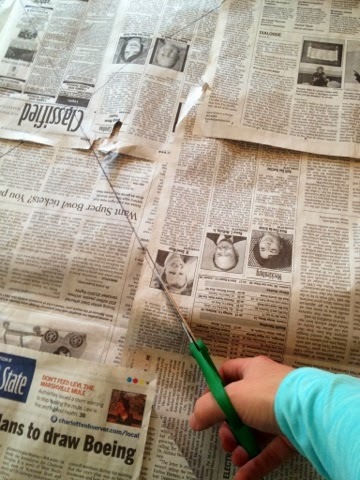 Start by spreading your papers out to the size you want. 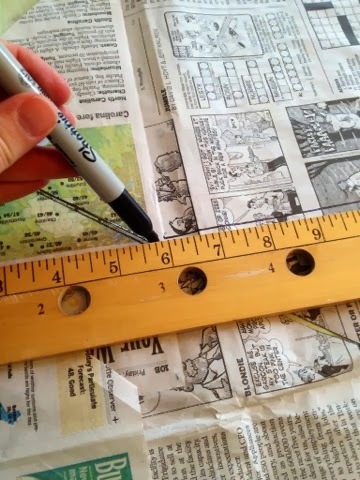 Tape the edges of the paper sections together to make it easier to draw your pattern out. Measure to make sure the pieces are even. Start adapting your pattern to get the shape you want. 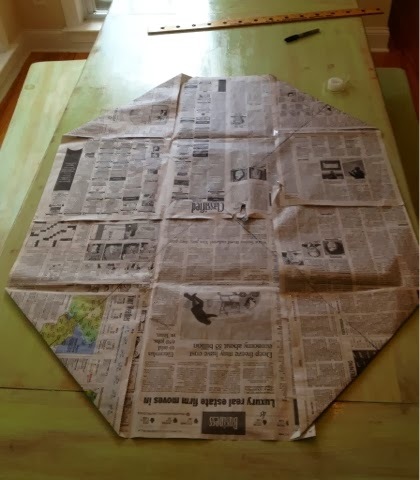 I folded the newspaper pieces into shape, but you could also just draw the pattern out. I wanted a kind of elongated octagon shape, so I folded the corners up. Measure to make sure you have the pieces even. See my cool vintage yardstick? I love it because it's from my grandfather's auto parts store! When I'm not using it to measure I hang it up as artwork! This was a little too long. I got the mat the size and shape I thought I wanted, but when I tried to gather it up like a bag it was too unwieldy. I decided to make it a little shorter by folding the ends up a bit more. When I had the general shape and size I wanted I measured all around to even out the pieces. Now, I could have just cut a front and back out of fabric and quilted those together, but the patchwork design on my inspiration piece was so cute I wanted to replicate that look. I also didn't have enough fabric for the front and back, just enough for backing. So, I drew the patchwork pieces on the paper. I found the center and drew four triangles. I started by marking the center of the mat. I drew diagonal lines intersecting at the center to make four triangular pieces. Then, I divided the triangles into two pieces each. You could add seam allowance to your pieces at this point, but I decided to add it when I cut the fabric out. I divided the triangles into pieces. I cut out the pattern pieces. The look I wanted was a solid -color rectangle in the center bordered by a patterned band. I looked thorough my stash and found a frog and bug print vintage corduroy. I think my mom bought this when she was expecting me in case I was a boy. I was not, however, and we never got any boys, so the fabric passed on to me! I found a cute sparkly star print on red cotton left over from a dress we made for one of my nieces long ago. I thought the sparkly stars would interest the baby and I liked the nature theme I had going. Keeping up with that theme, I decided to use another Pinterest idea. I recently saw the cutest pillow appliqued with a smiley-face sun with "rays" made of multi-color fabric (the link is on my sewing board). 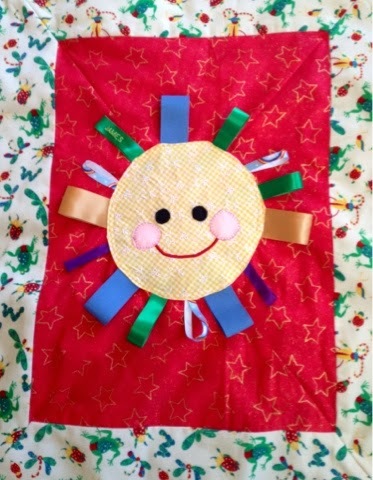 I decided to make an applique of a sun with ribbon "tags" for the baby to play with. My kids loved those Taggies books and things as babies, and this is the same idea. I added seam allowance to the fabric before I cut. When I'd picked the fabric it was time to cut. 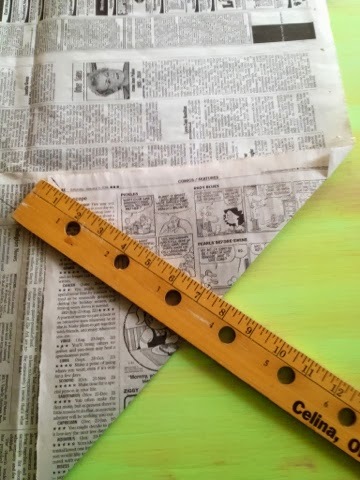 I added seam allowance of 5/8 inches by measuring from the folded edge on one side and marking the fabric with pencil on the other sides. I cut along the pencil marks. On the backing fabric I measured out 3 inches to add fabric for a "cheater" binding. That turned out to be a bit much so I trimmed it to 1 1/2 inches when I cut it out. I will write more about this later. 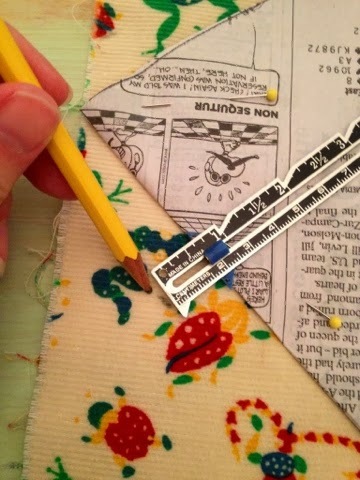 I add the extra fabric for a cheater binding. 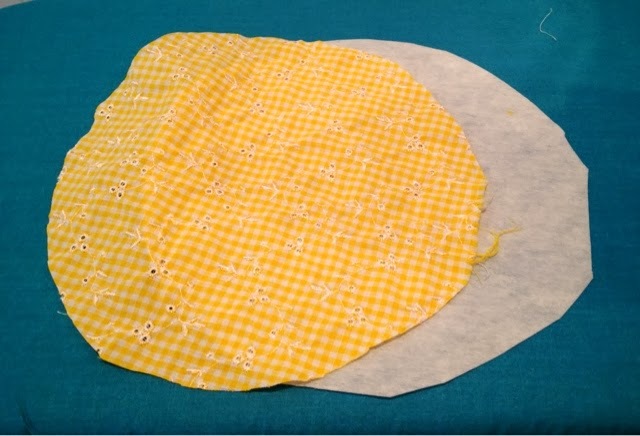 For the sun applique I picked a yellow embroidered gingham scrap left over from a dress I made my daughter years ago. I thought the baby would like the pattern of the embroidery to feel and look at, and I don't have enough of this to make much of anything else. I love the sunny color, too! I remember, with her dark skin and black hair, my daughter looked like a little Black-Eyed Susan in her dress! I cut one circle of fabric and one of interfacing for the applique. I traced a bowl to make the sun circle. I cut fabric and interfacing and then cut the interfacing 1/4 inch smaller all around. I needed interfacing so the fabric wouldn't bind up when I embroidered the face on the sun and also so the applique would look neat. This is a little easier with iron-on interfacing, but I don't have any. 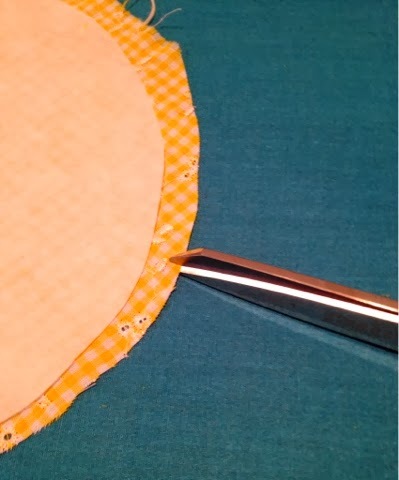 I clip the edges of the circle so it will fold over without puckering. Since the sun is circular, I clipped the edges a tiny bit all the way around to help it fold over neatly. Then I pressed the edges of the fabric over the interfacing to finish the edges. I press the fabric over the interfacing to finish the edge. After this, I embroidered the face on the sun. I used satin stitch for the mouth and felt appliques for the eyes and cheeks. I machine-stitched the appliques on using blanket stitching. This is a little messy. The unfortunate brain malfunction that made me wait until Wednesday to make a mat I plan to deliver on Saturday caused me to rush. If I do another of these I will take my time and make sure it's neater. When the sun's face was finished I sewed on the ribbon tags. I folded each piece of ribbon in half before sewing and applied them with the loop facing out. The finished sun applique with ribbon tags for rays. Once I'd finished piecing and sewing the quilt top together I sewed the sun applique on. I considered embroidering "You are my sunshine" across the top of the red rectangle, but my machine only makes small, like shirt-size, monogram letters, so I settled for just putting the baby's name on one of the ribbons. When the top was all finished I cut a piece of quilt batting the same size as the top and pinned the quilt layers together: top, then batting, then backing. I didn't want to do any large scale quilting on this. My great-aunt always hand-quilts hers with matching motifs, like spaceships on space fabric or flowers on floral fabric, but I don't have time, so I just used a machine clasp stitch, like a little starburst, here and there to join the layers. Then it was time for the binding. I am unfortunately terrible at binding quilts. Every time I get the quilt all done but the binding it looks great and then when I try to bind it nothing lines up and I end up with this horrible wadded up mess along the edges. So, for this quilt I decided to use a "cheater" binding I saw on Pinterest. 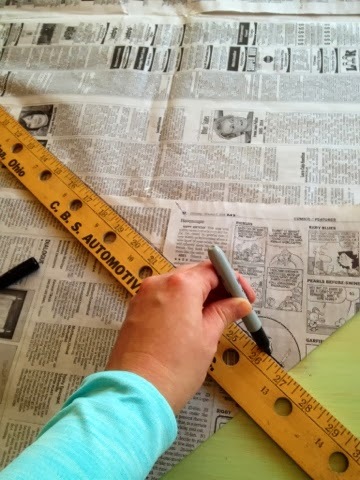 You just cut the backing a few inches bigger than the front and fold it over and sew. Well, it looks easy, but I messed it up pretty good. I think if I'd used a different fabric it would have worked. The only piece I had large enough was a really thin, crepey pique that's also a little stretchy and it just didn't fold over neatly or press crisply. (Again, the procrastination; I didn't have time to shop for fabric!) So, it looked awful as usual and I had to sew a band of seam binding over it to mask it. I used an embroidery stitch for this so it sort of looks like I meant to do it! Hopefully, the baby won't mind. Ribbon handles and ties allow the mat to fold into a bag. When the mat was all finished I added the handles and ties to turn it into a bag. I added two ribbon handles on top. Then I added one ribbon to each side so the mat can be folded and tied into a manageable-sized bag. If you don't mind a larger portfolio-sized bag you could add two ribbons at each side and tie the sides shut. 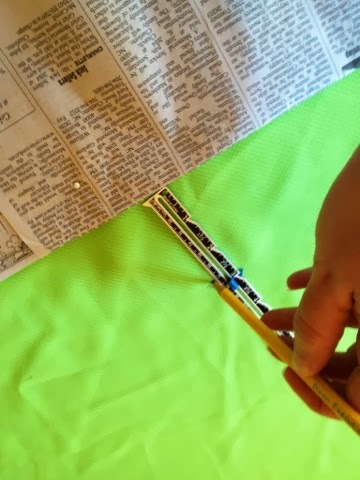 You could also add two to four ties on each side so even small items stay in the bag. I just felt like it was too large like that, and my sister has a diaper bag to carry small items, so I made the smaller folded option. 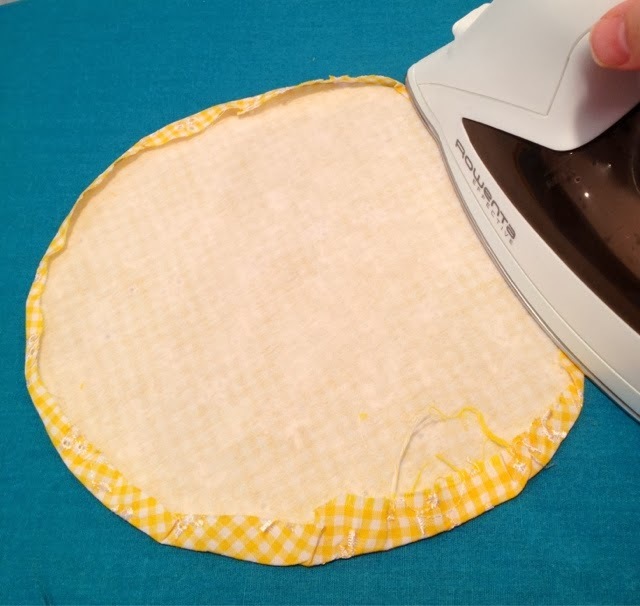 Another thing you could do with this is add pockets to the mat top before quilting it. Then you could keep diapers or small toys in the pockets and an older baby could play on the mat by putting the toys in and out of the pockets. There are really so many possibilities for this project! I might sew some variations, even without any new nephews, and sell them, if I can get the binding to look better. Check my store for that: http://stores.ebay.com/atelier-mandaline. All in all, I think this is pretty cute. In addition, I don't think my sister has anything like this. The new baby has three boys 2-5 years older than he in the family, as well as an older brother, so he's not lacking for anything in terms of clothes, blankets, or toys. I really hope they like it. 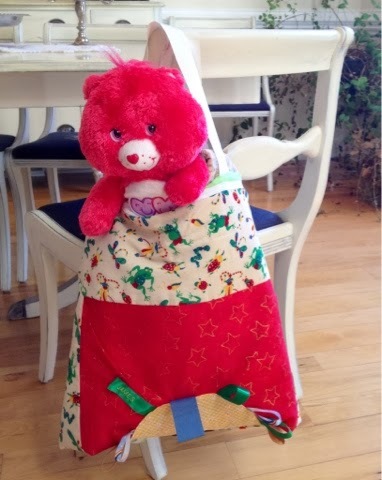 The bag can carry toys. In other news, while on my walk to the lake today I spotted a tree with lovers' initials carved into it long ago. I just had to take a picture. I know it's bad for the trees, but I thought it was just so sweet! I wonder if that couple is still together. What great joy it is to love someone, to welcome a new member to the family. It truly brightens the day just like sunshine! 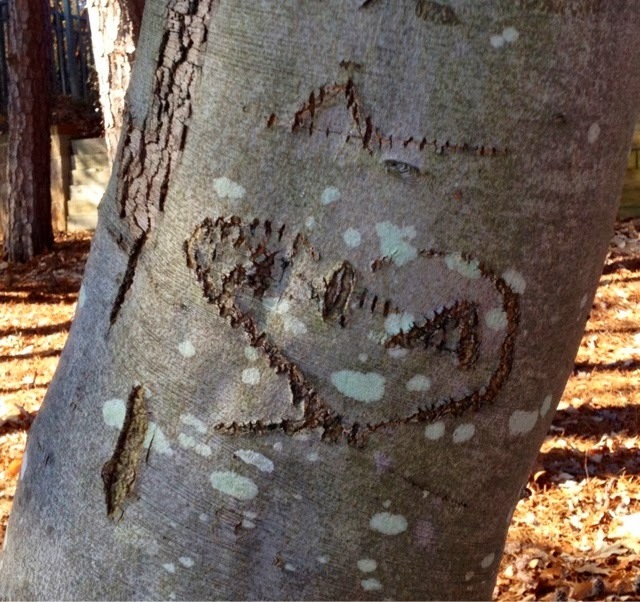 Lovers' initials carved into a tree. Today we are working more on the health of our bodies and our home. If you've been following this blog for a long time, you know I struggle with severe allergies and am also always trying to lose or maintain my weight. An issue I have with weight control is a persistent Vitamin D deficiency. I don't produce this vitamin well and struggle to absorb all my fat-soluble vitamins. This makes low-carb diets the best for me in terms of nutrition. Right now I'm avoiding all grains and sugars and keeping my carbohydrate intake as close to 20 grams a day as possible, so really low. It's a challenge to find new menus so I don't get burned out on the restrictions, so I've been spending a lot of time lately making up diet-friendly recipes. Today at lunch I think I came up with a real winner: Crunchy BLT Salad! In actuality, I used baby spinach rather than lettuce, so mine was BST salad, but it was good! Toss lettuce and tomatoes together. 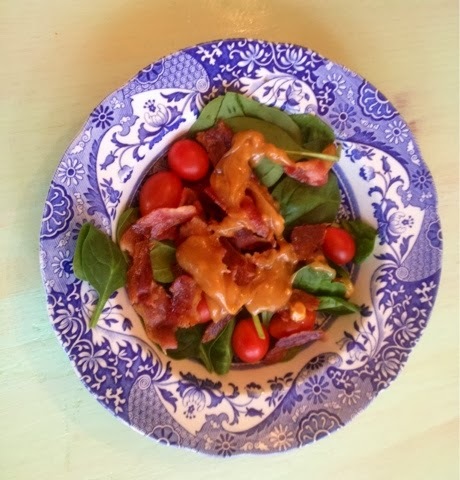 Top with crumbled bacon and peanut dressing. Use warm bacon if desired. Mix mayonnaise and peanut butter well until smooth. Set aside until salad is ready to serve. I used crunchy peanut butter to give more texture so I wouldn't miss the bread from the BLT sandwich as much. I also cooked the bacon right before making the salad so it was still warm when we ate. Delish! I think this is going to be a new favorite salad for me! 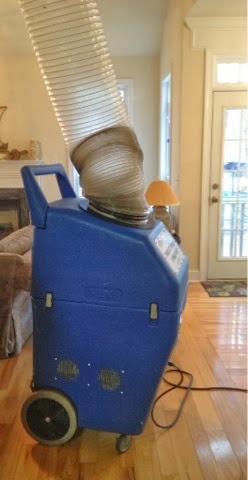 Besides our healthy new recipe, we are getting our air ducts cleaned today. Our house sat empty for a long time before we bought it and prior to that it had renters who didn't leave it terribly clean when they left. When we moved in the house was beyond filthy. The curtains and carpet in our bedroom were full of dead insects and gray with dust. The walls were dirty, and we found old food behind the drawers in the kitchen. We cleaned and cleaned, replaced the curtains and carpet, painted, took out the drawers and vacuumed behind them, but we still found clouds of dust as thick as dryer lint almost daily and my allergies have been just terrible all year. I have suspected for some time the air ducts were to blame, and today the technician confirmed they were choked with dust. I'm looking forward to a new year of enhanced health, with fewer allergies! Today I wanted to share a fantastic new recipe I tried yesterday. I made it up from various sources, and we didn't have a bit left over, so I think you might be excited about it too. Why am I so excited? Well, because the main ingredient in this recipe is cauliflower! And my kids scarfed it down like you wouldn't believe! What you do is grate up raw cauliflower using a box grater or food processor so it resembles rice. Then you sauté it in a couple tablespoons of oil until it's tender and use it as you would rice in any recipe. I got the idea from a Wheat Belly Jambalaya recipe, but you could use it for fried rice, chicken and rice casserole, and any other recipe you want! 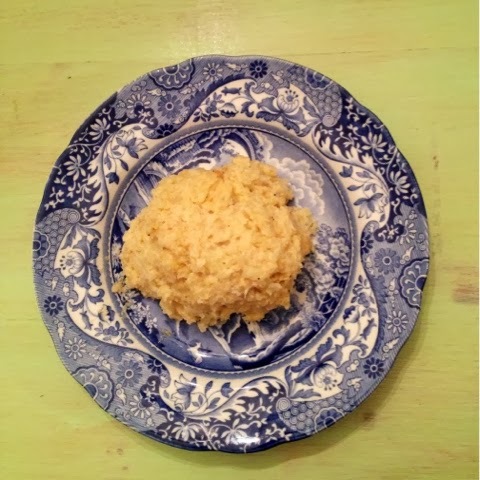 So, here it is, kid-approved Three-Cheese Cauliflower Risotto! One medium-size head cauliflower, grated into "rice"
Chop the cauliflower and grate it on a box grater or food processor into "rice". 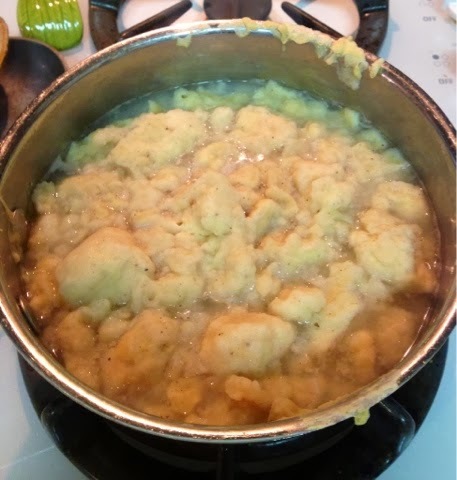 Melt coconut oil in a dutch oven or deep skillet and sauté cauliflower 5 minutes or until tender. Set aside. In a saucepan, melt butter. Stir in soy powder or soy flour, salt, pepper, and nutmeg and cook about 1 minute until thick and bubbly. Whisk half and half in all at once and keep whisking constantly until the sauce thickens, about 15 minutes. If the sauce is not tightening up enough, whisk in Xanthan Gum to thicken the sauce (I found this at Harris Teeter; you could order it from Vitacost or Amazon as well). Stir in the cheeses and keep stirring until the cheese melts and the sauce is smooth. Pour the sauce over the cauliflower "rice", stir to combine, and simmer about 30 minutes, stirring occasionally, until the mixture reaches the texture of risotto. Taste, correct seasonings, and serve hot. Before Christmas I'd been working on trying to lose the weight I gained over the course of a foot injury and then a long stretch of illness last year. We were doing a lower-carb diet where you were allowed to have a cheat night every fourth day. That wasn't working so well for me, though Jerry lost weight on it. Then I abandoned all attempt to lose over the holiday and just tried to focus on maintaining my weight. I've noticed restricting carbohydrates a lot, like eating only 20 grams on Atkins' Induction Phase, makes it much easier for me to avoid over-eating and especially stops me from craving junk and eating it at night. I really think different diets work for different people, probably due to genetics and individual metabolism, so you have to experiment and find out what works best for you. I also noticed, when I was eating the carbohydrate blowout that is Christmas dinner, my allergies seemed much worse. I've had this happen before when on diets where you restrict grains and then add them back. Adding grains to my diet when I've been restricting them often causes me to get itchy and rashy. Everyone always says that must mean I'm allergic to gluten, but that isn't it because I've had it happen with oatmeal and other gluten-free grains as well. This has thus far just been an irritating fact of life for me, but this Christmas things got scary. On Christmas Day I was just observing how itchy my throat and ears were getting and wondering if it was related to the unaccustomed foods we'd been eating when I went down to my sister's basement to look around. We hadn't seen her new house before and she and my brother-in-law were relating all the renovations they plan for the basement. When we came upstairs my tongue started itching really bad. I took some medicine, but that night my tongue and throat swelled so much I felt like I was choking all night. I've managed to avoid having an Epi-Pen all my life, but I may have to get one if I'm going to get fast reactions like that. Usually I have allergic reactions that escalate over several days so I have time to go to the doctor. My sister's house has a bunch of plumbing issues, and they've had several leaks, so my guess is they have mold hiding behind their walls. Mold is yet another allergen for me. I don't usually react that badly, though, so I was wondering about it. Then I was at the store a few days later and saw the January 6th issue of First for Women. I noticed it had a month of menus with shopping lists for a low-carb diet, so I picked it up. When I was first married I had an issue of First with a cookbook insert like that and we used it so often those recipes became staples in my weekly rotation, so I was excited to see a low-carb version. Well, besides the menu, there was an article about how manipulation of grain crops over the years has resulted in wheat that causes more celiac disease, allergic reactions, and insulin spikes than the wheat of 40 years ago. This isn't the only scary article I've read about this, either. I recently read another study that showed, even though seed companies claim seeds infused with Round-Up or other pesticides are safe for humans, they aren't. Some scientists believe the recent spike in leaky gut syndrome and celiac disease is due to the herbicides in the grain we eat acting on our digestive tracts as they do on weeds, by poking holes in the linings of our intestines as they do the sheath of the weeds' seeds. Even if you don't contract leaky gut syndrome, many scientists believe modern grains cause constant irritation and inflammation inside the body. I've heard this enough lately from a variety of sources to think limiting grains is a good idea for health as well as weight loss. I have enough trouble with irritants in my body because of my allergies, so I hope watching my diet will give my system a chance to rest and settle. I will let you know how it's working! 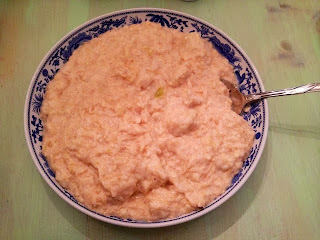 But I think my cauliflower risotto recipe is good enough even for people who aren't restricting grains to enjoy! Well, it's always something. That's what I've been dealing with all week. 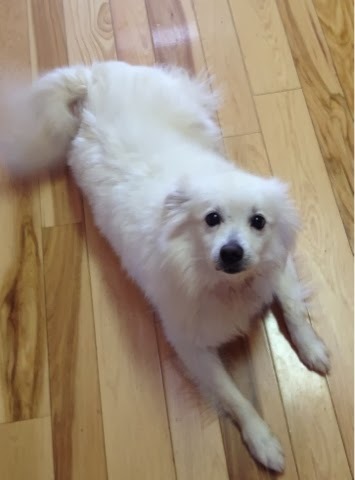 We came home from our travels to beach and mountains on New Year's Day and found one of our dogs, the Spitz, was dirty and stinky. We figured he'd rolled in something while we were away. We fixed and ate our lucky foods and then I told our teen to go give the dogs a bath. Well, right away, our son called us and we found to our horror the dirt and smell came from a terrible wound on the dog's neck, which had bled and festered. We don't really know what happened. We think the collar cut or irritated his neck and then he got all dirty so the sore became infected. 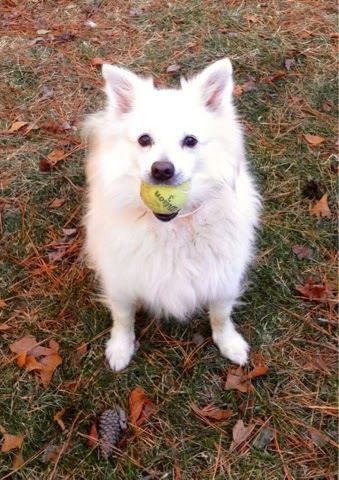 Our Spitz has a lot of fur and you couldn't see the sore itself, which was under his collar. You can't even see the collar, as a matter of fact, under all that fur. We had another teenage friend of our son feeding the dogs and bringing them in and out of the house, but we don't blame him since we couldn't see the wound at first either. Also, the dog wasn't acting sick or as if he were in pain, so there wasn't any red flag there. Naturally, this happened at night on a holiday! I felt so horrible and guilty to find our dog had been suffering while we were on vacation, and there was no vet open anywhere near here. Now, it just so happens that as a child I wanted to become a large animal veterinarian when I grew up. I didn't in the end because the allergist told me I would always be sick spending my time in barns and around animals, but now I kind of wish I'd done it because I'm sick all the time anyway and make a lot less money! But anyway, our neighbor and my best friend's father was the town vet and drove to farms all over the area tending to livestock as well as treating regular pets. He asked if I would like to assist him and see if I really enjoyed the work when I was about nine and my parents agreed to let me go. So, before the age of ten, I had helped deliver calves, assisted during canine surgeries, helped set broken bones and remove casts, treated wounds, and on one memorable occasion performed an autopsy on a lamb. The farmer called the vet because his lambs were dying one at a time, so we went out to autopsy the most recently deceased. I wasn't strong enough to open the abdominal cavity, so the vet cut the lamb open for me and then let me perform the rest of the cuts, telling me where to place the scalpel. The lambs had worms, it turned out, so then we knew how to treat the rest of the flock. All I can say is, thank goodness for that vet and for my rural Ohio upbringing, in which sending a nine year old to assist a farm vet is considered a perfectly reasonable parenting decision! I do have experience in wound care because of that and also due to my husband's life-threatening work accident and our children's surgeries. I wasn't sure where to start with this wound, however, because the fur had become a dirty, bloody mat over the sore. I wasn't a cut, it was more like a terrible scrape, so stitches wouldn't help. I didn't want to shave the infected skin, so I carefully cut the fur away from the wound with scissors. I worked pretty much one hair at a time and it took forever. When the hair was cleared away I cleaned the whole area as gently as possible with regular soap and water and then again with hydrogen peroxide. Then I applied Neosporin with pain relief and bandaged the area with gauze and tape. I thought that would keep the dog as comfortable as possible until we could get to the vet in the morning, but I really wished I had some antibiotic to give him so we could knock the infection out immediately. Thinking for a while, I remembered oregano. I've mentioned before, this herb is considered the most powerful herbal antibiotic, but I read recently that strong doses are more effective than penicillin. 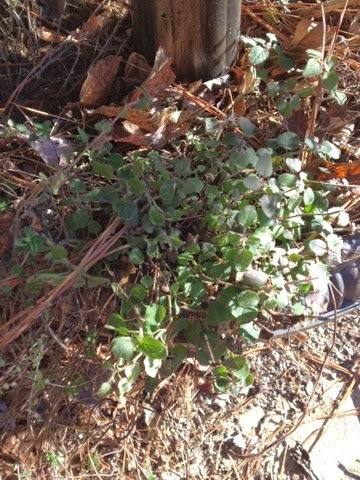 We looked up oregano to see if it is safe for dogs, and it is, so I went out to the garden and picked some. I ground about a tablespoon of fresh oregano with a mortar and pestle to release the oil and then wrapped it in natural peanut butter to make a "pill" our dog would take. He loved it and gobbled it up! In the morning I could not believe the improvement in the wound when we removed the bandage. I decided we could wait until Monday to see if he needed the vet. In less than eight hours, almost all sign of infection had disappeared and the wound had shrunk by half! I've never seen anything like it and I know it wasn't just due to the Neosporin and hydrogen peroxide! I was so impressed I ordered oregano oil to keep in our first aid kit just in case I don't have any in the garden when it's needed. Now, less than a week later, the wound is a spot the size of a pencil eraser (it had originally been about the size of a quarter), and it seems to be healing incredibly fast. There is no infection at all. I am watching it very carefully and we will of course go to the vet if it doesn't continue to improve. I've kept the dog on his oregano and peanut butter medicine twice a day and I clean his neck twice a day and change his bandage. 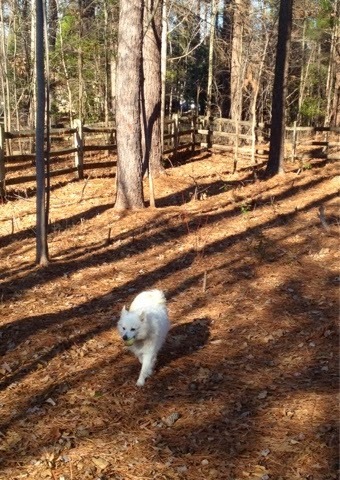 The dog is acting like himself, running around playing his favorite game : Keep Away. He loves to have you throw him a tennis ball and then he pretends he will give it to you but runs away with it at the last second. He's eating well and is full of energy. He also is indulging in his bad habit, which earned him the nickname "Mr. Potty Britches" at the vet's at home. He's what my grandfather called a "whizzler", meaning a dog who pees when he's scared or excited. Our dog also likes to pee on anything new in the house and at the corners of the bed posts and stuff. It makes me wonder why I saved him! During the Blizzard of '78 we found a dog shivering in a snow drift at the end of my grandparents' driveway. His paws were bloody and he was trembling, so they brought him in. I had recently either watched or read 101 Dalmatians, so I immediately named him "Dalamatian" because I couldn't pronounce it properly. Dalamatian was actually a beagle. But alas, Dalamatian was a whizzler, so my grandparents sent him to the pound while I was out shopping with my mother and told me his real owners had come to get him and were so happy to see him. I didn't find out his true fate until I was in college! So, I guess my Spitz is lucky I'm more soft-hearted! Please understand, I am not advocating eschewing medical care at a doctor's office, but I thought you might like to hear about our success using a natural remedy as emergency treatment when no other option was available. I've decided we are going to add a lot more oregano to our diet, just to nip any bacteria in the bud! Now that this crises appears to be averted, I will try to get back into my studio and back to work. You can order Young Living Oregano Oil from me. Go to Young Living and type in my number: 2256091. You can find many more natural remedies and recipes on my Facebook page, Naturally Amanda. Make sure to like my page so you'll see all my newest posts! I always think of the first day of the year as the Janus day, the day when we stand with one foot in the past and one in the future and can look both backward and forward like Janus. On this day, when the old year dies and the new one is born, we can see life as it is and as we hope it can be simultaneously. For at least seven years now we have celebrated the new year with my sister and her family with a Wii tournament. No one thought to mark the first year of the competition and now our memories are fuzzy and we can't recall when it started exactly. When we first started our nine-year-old daughter was a toddler and we would give her a fake controller to keep her occupied. This year's holiday schedule was exciting and exhausting. 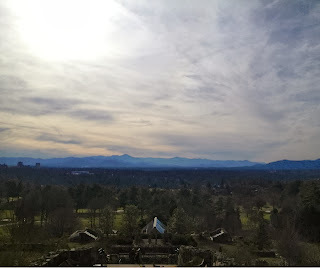 We returned from Georgia two days ago, washed a bunch of laundry, packed our bags, and set out for the mountains of Asheville for the tournament. Yesterday, New Year's Day, the kids woke up around eight, despite all of them, even my two-year-old niece, staying up past midnight. I got up and made pancakes for them and then we set out to tour the Grove Park Inn, Asheville's iconic hotel, 101 years old this year. It's always fun to go and rock in the chairs in front of the giant fireplace and take in the glorious view from the back porch, but during the holidays it's wonderful to see the gingerbread houses and theme Christmas trees decorating the hotel. The beauty of the grounds provides a great environment for reflection, even with all the guests touring the hotel. We set out for home around three yesterday and were still home in time to make our lucky New Year's Day foods. I'm superstitious. I've eaten sauerkraut every New Year's Day of my life except one year, 1994, and it ended up being one of the worst years of my life. So, I always eat my sauerkraut now, and in deference to our relocation to North Carolina I've also added black eyed peas to the repertoire. My mother used to serve both these by dumping them out of the can and heating them up with no seasoning or anything. Not surprisingly, they were awful and we choked them down reluctantly. Then, in 1993, I spent Christmas in Germany and discovered a yuletide dish in a Weihnachts market booth. This was sauerkraut, seasoned with sauce like pasta and mixed with Spätzle, served in a paper cone. It was fabulous! I found in Germany, sauerkraut is served like pasta with a variety of sauces and it tastes so much better than I imagined it could. The secret to removing the bitterness is very thorough rinsing and draining and long cooking time. Years later I tried to re-create the recipe from memory and I ended up with a lucky food everyone loves. I make homemade Spätzle for the sauerkraut. These are fluffy egg noodles rather like a cross between biscuits and dumplings, seasoned with nutmeg. They are quite easy. You just mix up the batter and drop it through a slotted spoon into boiling water to cook the dough. I'm happy to share this fortune-lifting recipe with you. Combine and stir over very low heat until sauce thickens slightly. 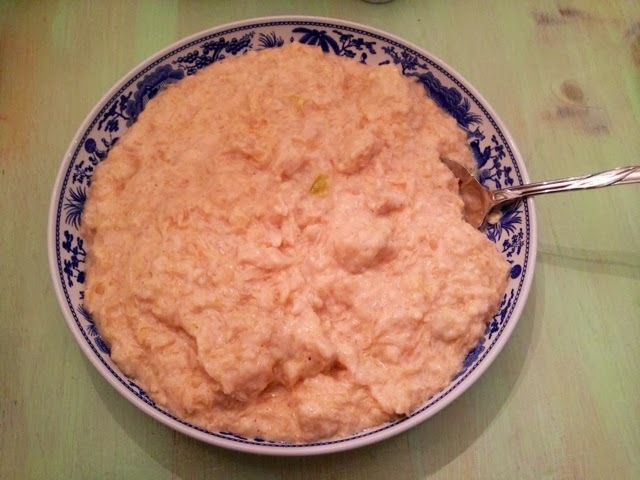 Stir in rinsed and drained kraut and Spätzle. Stir until heated through. For milder kraut, cook longer. 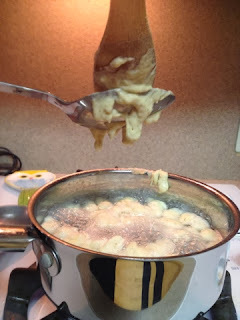 Press the Spätzle dough through a slotted spoon into simmering water. Beat 2 eggs. Combine well with: 1 1/2 cup flour, 1/2 cup water, 1/2 tsp. salt, 1/4 tsp. double-acting baking powder, dash nutmeg. Press dough through slotted spoon into simmering water. Simmer until noodles float. Drain and serve. If the dough is to thick or heavy add more water. The Spätzle is finished when it is light and fluffy and floats to the top. I prefer the refrigerated fresh kraut, but it's very difficult to find down here. At home it's rarely available at all. Here, you can tell there are a lot more Northerners because when I went to buy the kraut on the evening of New Year's Day there was a spot for it but it had sold out. One year I had a lot of cabbage from the garden so I made my own fresh lacto-fermented kraut, which isn't canned and retains many more nutrients. In Ohio where I grew up sauerkraut crocks are so plentiful they're used for everything from umbrella stands to waste baskets as well as for making sauerkraut, but that's another thing that's hard to find around here. My Aunt Carol's mother used to make homemade kraut so pungent the crock had to sit outside under a tree to ferment! You might notice this recipe makes a ton of sauerkraut. When we lived at home we all met at my mother's on New Year's Day to eat the lucky foods and I developed the recipe to feed a huge crowd and have some left over for making our favorite Reuben sandwiches. You might want to halve the recipe if you aren't cooking for 20 or more. 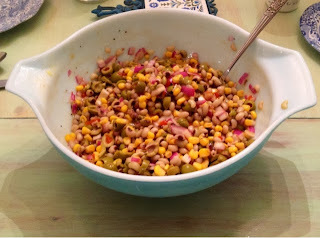 After making a better recipe for the sauerkraut we decided to tackle the black eyed peas. 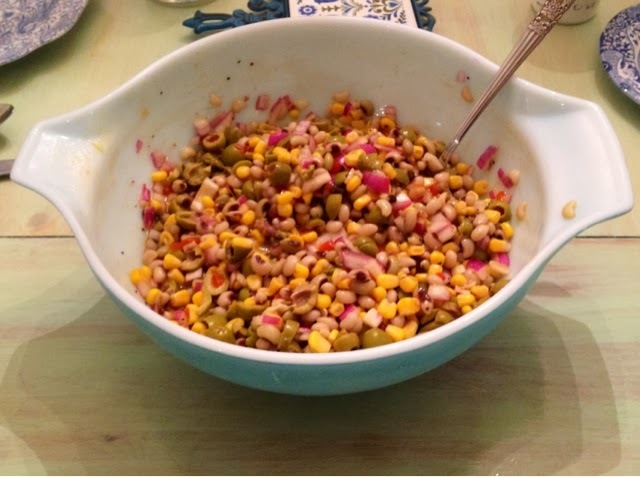 A grocery store at home started making a bean salad with black eyed peas called "Carolina Caviar" a few years ago. It's another much better recipe for the lucky food than I was used to growing up. My friend made a copycat recipe and I adapted it to suit our taste a bit better. Again, I prefer the frozen peas to the canned, but you can use either. If you use canned peas, rinse and drain them well. Thaw frozen vegetables and drain. Chop all ingredients and mix with dressing. Refrigerate for at least 30 minutes to blend flavors. Now our lucky foods are eaten and we are ready for the new year. I hope we are lucky and grow a bit more into the people we are supposed to be. May the year bring us all those things we need and guide us to our best fate.